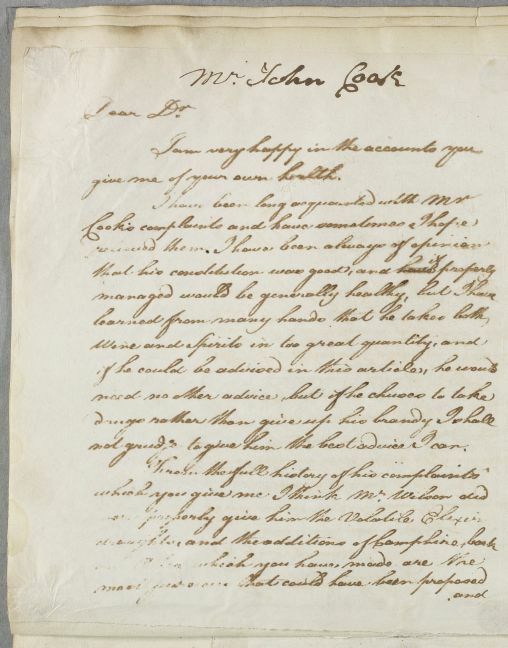 Reply, for 'Mr John Cook', to Dr Charles Keith, enclosing an aperient prescription. 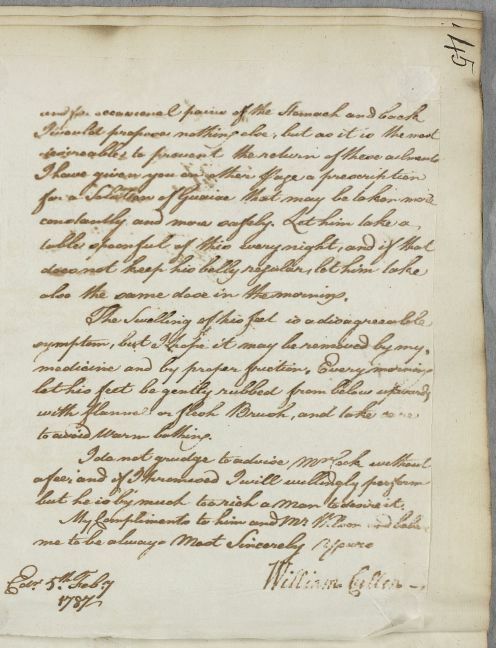 Cullen is aware that Cook 'takes both Wine and Spirits in too great quantity', but 'if he chuses to take drugs rather than give up his brandy I shall not grudge to give him the best advice I can'. 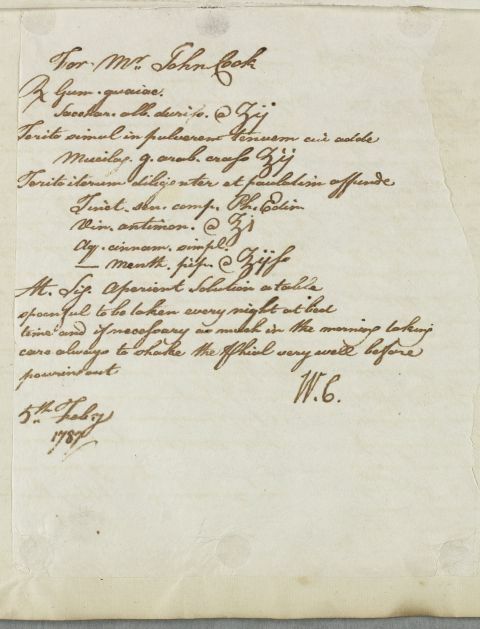 Summary Reply, for 'Mr John Cook', to Dr Charles Keith, enclosing an aperient prescription. Cullen is aware that Cook 'takes both Wine and Spirits in too great quantity', but 'if he chuses to take drugs rather than give up his brandy I shall not grudge to give him the best advice I can'. give me of your own health. I have been long acquainted with Mr.
not grudge to give him the best advice I can. also the same dose in the morning. but he is by much too rich a man to desire it. Take two drachms of Guaiac Gum and two drachms of white lump Sugar. Rub together into a fine powder, to which add two ounces of coarse Gum Arabic paste. Rub together again throughly, and pour over one ounce of the Edinburgh Pharmacopœia's Compound Senna Tincture, one ounce of Antimonial Wine, two and a half ounces of simple Cinnamon Water and two and a half ounces of Peppermint Water. Mix. Label: Aperient Solution; a tablespoon to be taken every night at bedtime and if necessary as much in the morning taking care always to shake the Phial very well before pouring out. Tinct. sen. comp. Ph. Edin.